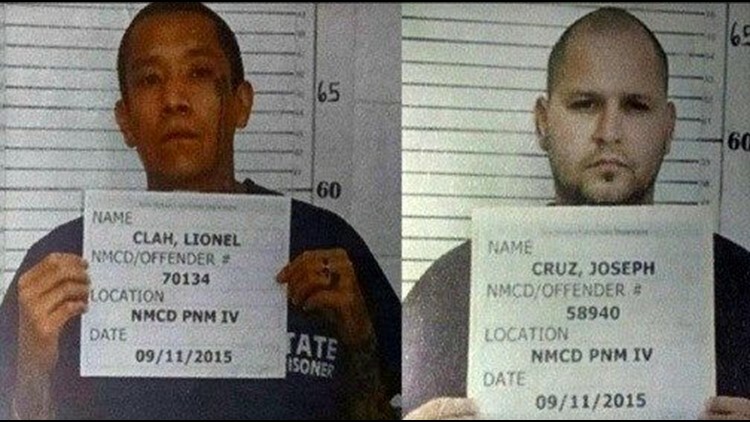 The second of two New Mexico convicts was taken into custody in Albuquerque on Saturday, less than a day after the other one's capture. ALBUQUERQUE, N.M. (AP) — The second of two New Mexico convicts was taken into custody in Albuquerque on Saturday, less than a day after the other one's capture. Lionel Clah was arrested in a northeastern part of the city, police spokesman Simon Drobik said. He will now be transferred into the custody of New Mexico State Police. His capture ends a three-day manhunt that started in southern New Mexico. Undeterred by shackles, Joseph Cruz and Clah — a convicted murder and another convict with a violent history, respectively — somehow slipped away in white prison jumpsuits and vanished into the night with no one noticing, possibly for hours. They hitched a ride and made it to Albuquerque around the same time that authorities notified the public of the escape. Cruz, 32, was taken into custody in Albuquerque after a brief foot chase Friday evening, deputy federal marshal Ben Segotta said. But corrections officials were still struggling to answer embarrassing questions about the missteps that could have been made, including how the men could escape when authorities say they were last accounted for in leg irons and belly chains. The questions only helped to highlight concerns raised in recent months as the department struggles with a budget crisis, a guard shortage, overworked employees and other problems. Gregg Marcantel, the state corrections secretary, said the two unidentified guards were placed on administrative leave pending the outcome of the investigation into the escape. "Anything less would be remiss," he said as he left Friday's briefing. State Police Chief Pete Kassetas wouldn't say whether investigators had determined how Cruz, convicted in the death of a man over drugs in Raton, and Clah, 29, who was serving time for armed robbery and shooting at a police officer, escaped the fortified prison van that was transporting them from the state penitentiary in Santa Fe to the southern region of the state. Authorities raised the likelihood that the getaway happened at the gas station in Artesia, was planned and that the fugitives were receiving help from others. But they wouldn't disclose what surveillance video from that gas station may have revealed. "We're definitely talking to family members, friends, associates, whatnot. They're getting help, no doubt about it," Kassetas said. Cruz's sister, Olivia Cruz, also was arrested Friday. According to state police, the 38-year-old woman had an outstanding warrant for possession of a controlled substance and is being held on no bond. Investigators are looking into whether she had any involvement in the escape. Standard precautions for transporting prison inmates include a search of each prisoner and the vehicle at each stop for clandestine tools or weapons, said Gary Klugiewicz, a former inmate transport trainer with security consultant Vistelar in Wisconsin. Officer fatigue and complacency can undermine security at the end of long a long trip, he said. High-risk inmates should rarely — if ever — be allowed out of sight. "What if they have a medical emergency?" he said. "If you're sitting in a van, the point is, and you have a murderer behind you, how much would you have visual contact?" Before Cruz's capture, both men were spotted on surveillance video at a hotel in Albuquerque. Gone were the shackles and white jumpsuits. Clah was wearing a red T-shirt and jeans and Cruz a tan, collared shirt and jeans..